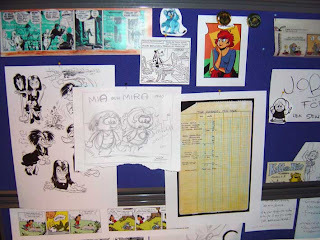 Just to show you what Long Sam looked like when it was published here in Sweden. 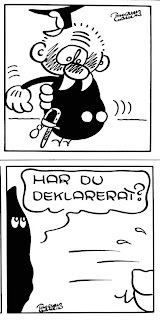 This panel of Vildkatten (the wildcat) is from the weekly "Året Runt" #41, 1960. 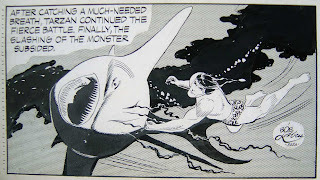 Yeah, I know, there has been plenty of Bob Lubbers artwork on the blog lately. Here's a piece I bought a few years ago. 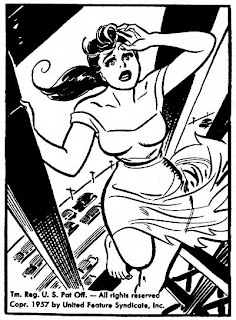 Comes from Orlando Country Club wich once had plenty of similar pieces by different cartoonists, like Alex Raymond, on their walls. And look here! Yet another of those Barks forgeries. 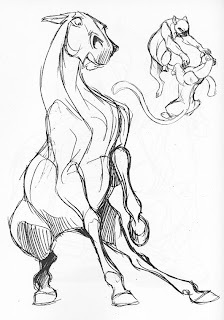 Think this is the third one with the same drawing traced from the 50's model sheet. Already got bids on eBay... $75 and the bidding has just begun. I was flipping through my collection of Bob Lubbers Robin Malone sundays yesterday and I found some coloring examples that I just wanted to share with you. 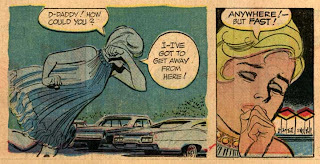 What struck me the first time I saw a sunday page by Bob Lubbers was his use of color. Instead of coloring the page after a formula and giving skin tones to every human in every panel etc. he chose to make extensive use of color to express a feeling. Or to highlight something or to make the reader to focus on what's important. 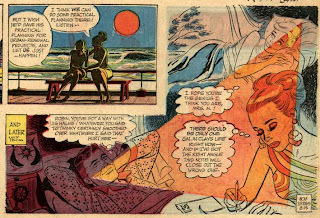 By looking at these panels you can tell that he loved to experiment to get the reader in the right mood. Not only by words and pictures but by the coloring. 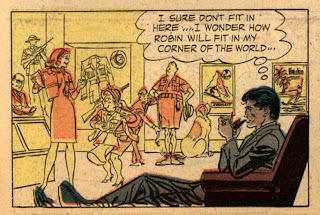 In the sample below you can really feel the distance between Adam and Robin, and how he's in his own world thinking for himself. If you are in Stockholm this weekend you can grab a copy over at Kulturhuset's SPX. If you want to buy a copy feel free to mail her at vixie_87 /at/ hotmail.com and she'll let you know the price etc. As "dl" guessed the plot in the previous post was written by Carl Barks. And since it's labelled "Idea for future story, Scrooge O/S." I assume it's from the early fifties. 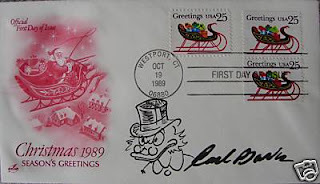 (There were only three Uncle Scrooge O/S.) Barks from his peak period in other words. This plot is not in any of the library books. 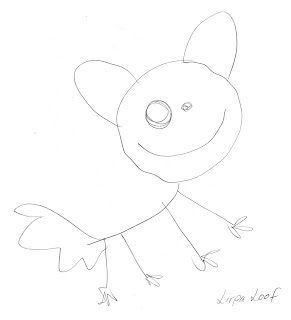 And as a bonus for todays post you'll get a photo of Barks first draft. Notice that there are differences. Click to enlarge. Now here's a question: Who wrote the following piece and when? 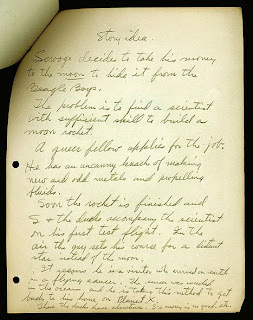 I know the answer but let's see if any Disney experts out there can figure out who the writer is. And wich year it's from. Scrooge finds that he has cornered all the money in the world. He is no longer happy with no new money coming in. There he hopes to start cornering all the money in the universe. 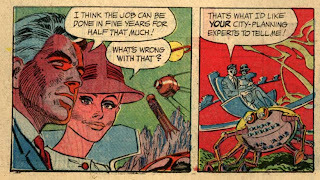 The scientist is a queer-acting guy that has an uncanny knowledge of rare metals. He later proves to be a native of the new planet who had crashed on Earth in an exploratory rocket from space. He is anxious to get back home to Planet Z, and takes off with Scrooge and the ducks before they have had time to load much of Scrooges fortune aboard. On the new planet the ducks find many strange sights and things. Scrooge's money is worthless, but he learns the trick of their trading, and soon is fabously rich in Planet Z money. Do you think you are a fast artist? The speed he had while doing some of his finest stories (Both when it comes to scripts and artwork) is stunning. Was home sick yesterday with a fever. No fun at all. 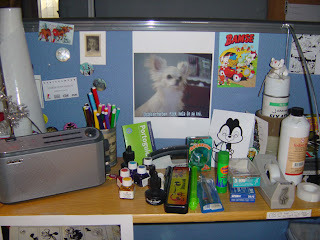 My body is still working on getting a "back to normal" feeling. 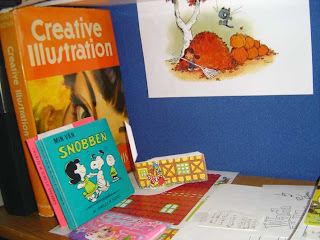 But I'm in the studio now taking a break from my inking. Not that inspired today so I thought I should post the stuff I promised the last time around. 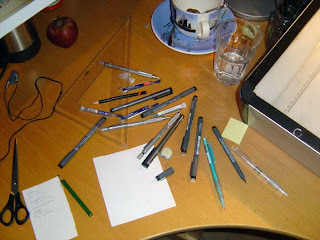 To pencil I use three different sizes of GraphGear 500 from Pentel. (All depending on if the details are small or big. Sizes vary from 0.3 to 0.9) They have a wonderful weight that makes them great to work with. All with HB leads. 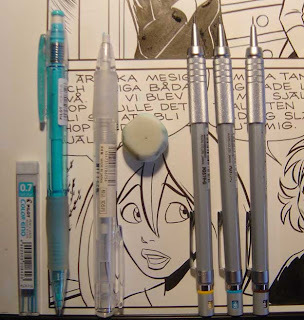 To erase the pencil lines I either use a standard eraser or (for small details) a japanese eraser pen that I found on Åhlens in Gothenburg. For lettering (Everything I do is hand lettered...) I use a Staedtler pigment liner 0.3 for standard size letters. The nibs I use are Brause 511 and 513 all depending on the mood I'm in. (One is stiffer the other softer.) 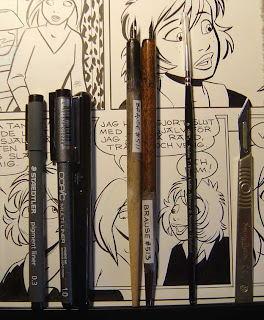 Those I use on "Katten Nils". For "Emma & Sara" I use a W&N series 7 size 0. But since the quality is so crappy nowdays I'll probably switch to another brand. To erase mistakes after I've inked a page I use a scalpel. Then something to brush away all the dust from the original after I've erased the pencil lines. 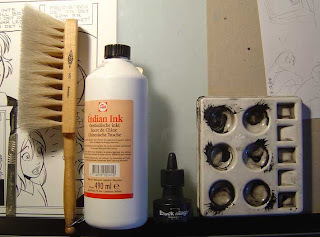 I use Talens ink that I pour over from the big bottle into the smaller bottle. That way the ink stays fresh longer. The worst thing to work with is ink that has been exposed to air a long time and has become thick and hard to work with. Impossible if you work with nibs. 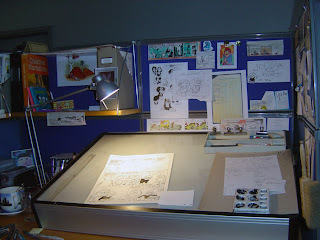 For some more on my working methods please see the entries for February 2007 here. First we have an overwiew. I might add that I don't necessarily use all of the pens and stuff I have. But you'll never know when they will be in handy. 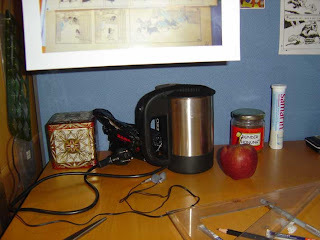 In part two I'll take a closer look at the tools I use. 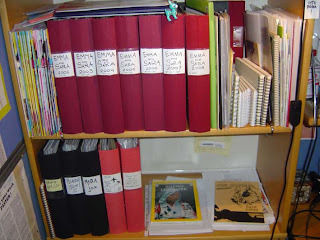 My Emma & Sara blog has been updated with a page from 2004 today. 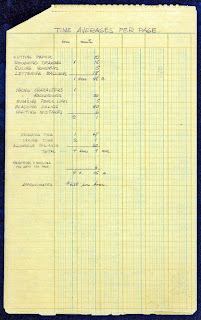 The first in a series of pages from that year that will be posted this and next month. 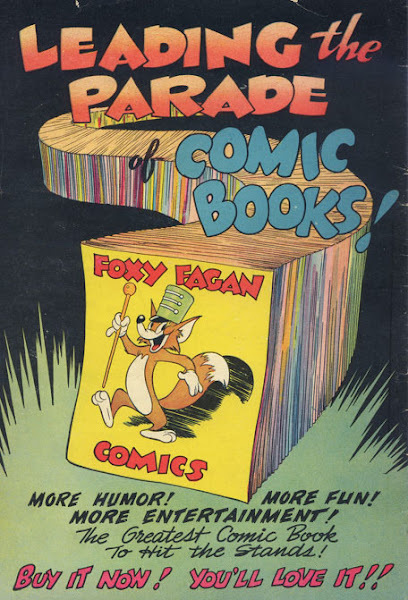 Shane Glines has started a Cartonretro blog with previews of what can be found on his Cartoonretro site. 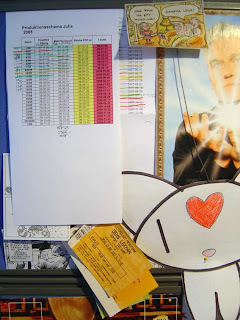 Plus that it features extras just found on the blog and not on the site. 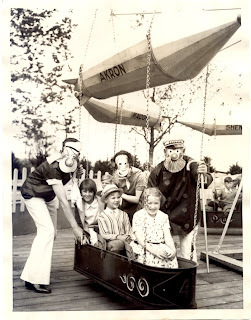 The first one is from May 23, 1933 taken at the Chicago World's Fair. 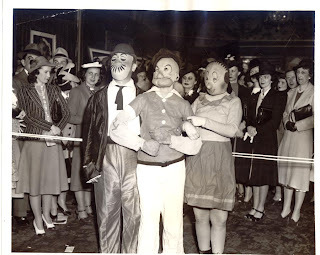 The second is from April 26, 1939 and has the following caption on the back: "KFS comic strip characters arrive at KFS performance of Hellzapoppin'"
And here's a bonus Segar I saw on eBay a while ago. Enjoy! Here's an unusual piece by Russell Patterson. Dunno who ended up with it. Hope it will see print one day. I used to have and use a brush for up to 6 months before. Not anymore I guess. THE EVENING CAPITAL. ANNAPOLIS, MARYLAND, SATURDAY, JANURY 31, 1942. [Some parts of this text are f**ked up by the "translation" from the microfilm. comic strip artist the other morning. lite sergeant, "and when I came out, it was gone." steal cars up here in Harlem. ride. So he hops in your car. even catch him in it. Come on." doned it there, leaving no clue. interested in catching the culprits. 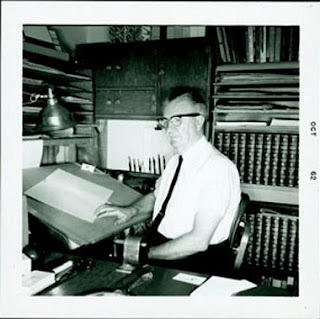 You are bidding on an original art by Arthur Floyd Gottfredson (May 5, 1905 - July 22, 1986), an American cartoonist best known for his defining work on the Mickey Mouse comic strip. 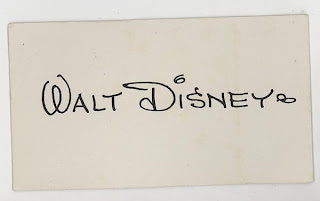 Hand drawn Walt Disney logo, undated. Pen and ink on a business card size blank card. 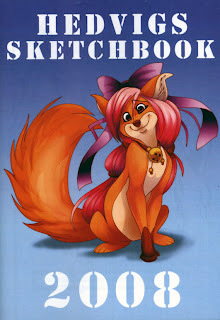 Now, I wonder why they believe that it's by Gottfredson? First time I've seen an autograph (without art) for sale that isn't by the person whose name appears on the autograph card. 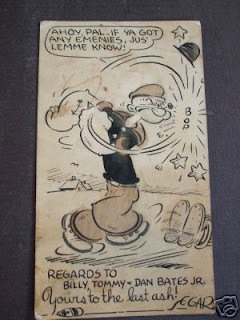 It's just such a bizarre little gem that I couldn't resist sharing it with you wether it's a Gottfredson piece or not. It's sunday evening here in Malmö, Sweden and I'm back in town after a few days away. Having mostly relaxed this weekend. I watched 101 Dalmatians on DVD and I had a great dinner at a greek reataurant last evening just to mention two things I did. 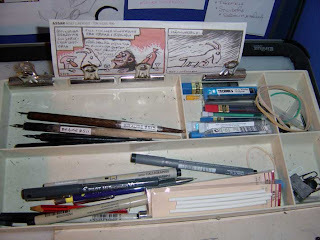 I also bought the remaining "Fredrik" strips by Torvald Gahlin that I showed some samples from in an earlier post. And this evening I'm scanning them and making them ready for print. 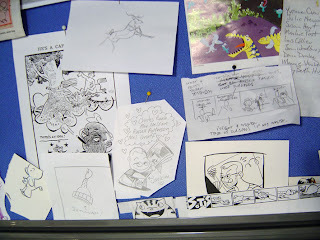 Thinking about making a very, very, very limited edition of all the strips I found (31) before the originals are scattered with the wind. PS. For those of you who wonder what happened with my Adv. 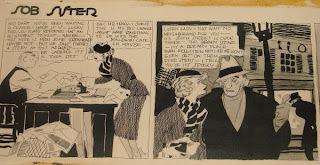 of Patsy project: I'm still hoping to find more strips to make my runs complete before doing more. If you got strips and are willing to loan or sell me, please let me know! 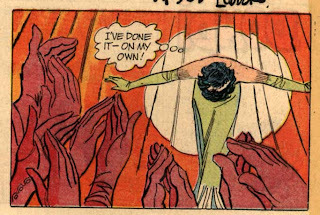 Also: I recently saw that there are two volumes of 1938 dailies for sale on eBay. (Publ. by Tony R.) Anyone who got those? Is the reproduction good? Excellent? Or terrible? 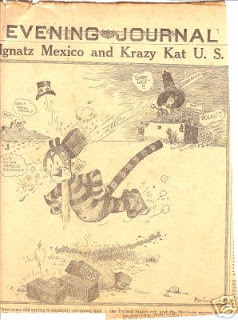 An early and nice tearsheet featuring Krazy Kat and Ignatz from 1916. From the collection of Ron Goulart. Have you ever dreamt about walking in to an antique store just to find a stack of original art among the old lamps, tables and used tin soliders? 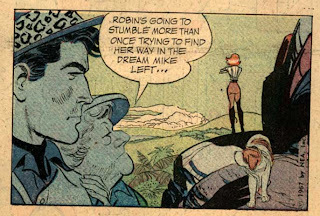 And the artwork then turns ot to be comic strip art from 1990? 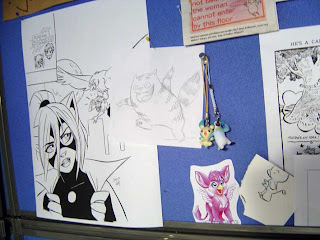 And by an artist you happen to like and never seen original art by before? The artist is Lirpa Loof, and is very famous here in Sweden, known for her very detailed and advanced drawings.